The Digitise Africa Trust is looking to recruit retired teachers, historians, archivists, journalists, librarians, archaeologists, museologists and other researchers to join our growing community of volunteer metadata capturers. 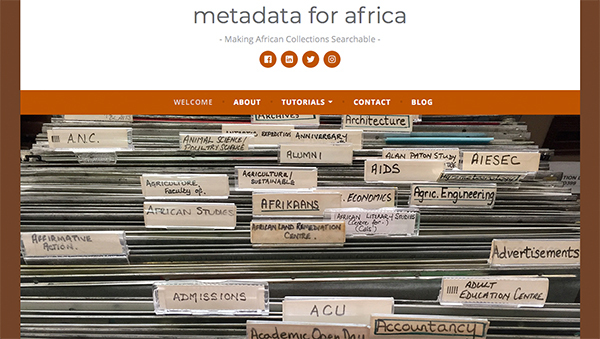 Metadata for Africa is a community of skilled people who are passionate about contributing to Africans telling Africa’s story – enabling the best of African historical, cultural and natural collections to get to an African and global audience. We are looking for people who believe in enabling the African story to be heard from an African perspective. So much of Africa’s story is told by those outside of Africa. We are contributing to changing that, to making primary material about our history, culture and natural resources available to the World. We do this by adding information to digital files such as photographs, audio, video and manuscripts – information that can be used to search for and find these digital files. For instance, we might add a caption to a photograph, that explains what is in the photograph and we may add keywords that highlight the main subject matter of the photograph. Often there is some information associated with the files and we are able to bring order to that information. At other times we need to do some research to add useful information to the file. Mostly we do this from the comfort of our own home, working on our own computers with an internet connection. So if you have a broad general knowledge and the ability to research and have a passion to contribute some of the wealth of what you have gained over the years towards making Africa’s primary memory resources available for current and future generations, please let us know by signing up here. Some of our projects have sponsors and so work is paid for. One such project that we are currently busy with is the ANC Archives Metadata Project for which we need a large team of enthusiastic and skilled people. If you are interested or you know anyone who would be, please sign up or contact us.